We would like to remind that **31st March 2019** is the deadline for sending an application for International Tournament THE ANXUR BATTLE 2019. 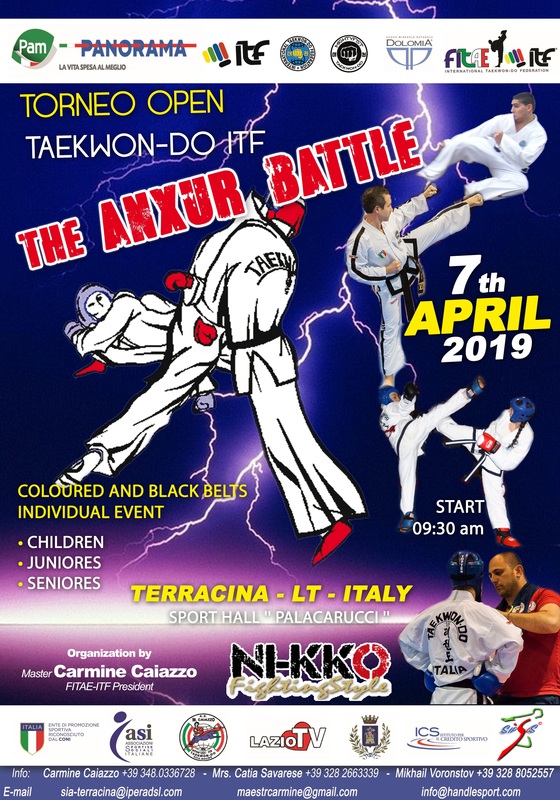 The tournament will be held on Sunday 7th of April, 2019 in the sports hall “PALACARUCCI” Terracina (LT) Road “Viale Europa” and is organized by “Taekwon-do Center ASD M. Caiazzo” (Master Carmine Caiazzo – Italian Taekwon-do ITF Federation President) in collaboration with ASI (Italian Sport Alliance). THE ANXUR BATTLE is open to competitors from 6 years old divided into Chicks (6-7 years), Dragons (8-9 years), Kids (10-11 years), Cadets (12-14 years), Juniors (15-17 years), Seniors (18-36 years). If it’s required a division for veterans (36 years and older) the organization can do it. The organization may add other categories if necessary. A nice holiday for competitors, officials and family members are guaranteed. We are very much looking forward to your participation. See you in Terracina, Italy.